How Many Baskets Do You Have Your Eggs In? I tried to explain that the harsh reality faced by small to medium-sized farming operations today is that off farm revenue is needed to keep your operation healthy and sustainable. Also having another job didn’t mean a lack of interest in farming. In fact you could argue that it is a sign of just how committed to the land some people are – working 16 hour days just to keep their passion alive. Alf wandered off down the road grumbling. I think he could see my “not having all your eggs in one basket” point but he is not one to admit it. I got to thinking after our little encounter that not for profits face the same dilemma – but how both groups tackle it tends to vary considerably. 1. Have a darn good reason to diversify. Farmers I know have “off farm” jobs because they have to. It is a means to an end. The second job is seen as supporting the main cause – in their case the farm. But to put it bluntly, if they didn’t need the extra income to reinvest in the farm they probably wouldn’t have a second job! 2. Get into something you know and are good at. I realise I am talking about a very small sample here, but many good farmers I know are also very competent builders, electricians, business consultants, plant operators etc. The lesson here for non profits is to only diversify into a new business area where you have the organisational knowledge, ability and desire. Chasing new contracts shouldn’t be an ego trip. It must be a researched strategic decision. 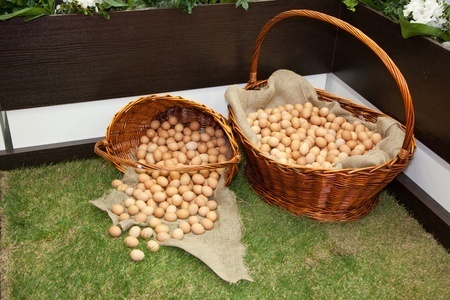 Do you need to reconsider the number of baskets your organisation has its eggs in? About Chris: Chris Gandy is a farmer and the founder and a director of Cause and Effective – a provider of contingent resourcing and leadership search services to cause-based organisations.